Merry Christmas! I know it’s been some time since my last post. Life offline has kept me away from this blog lately so I haven’t been able to post anything for most of the year. But even though I’ve been away, that doesn’t mean I’ve totally forgotten about it. I have lots to post and I’m starting with this recipe! 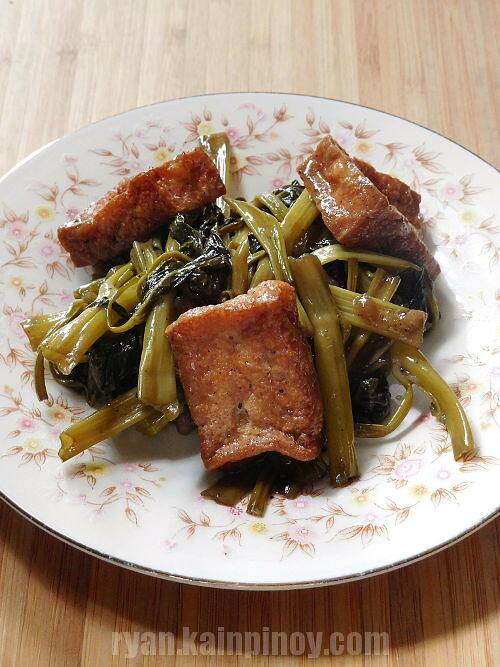 This Stir-fried Tofu and Kangkong with Oyster Sauce is something we’ve been making at home a lot lately. 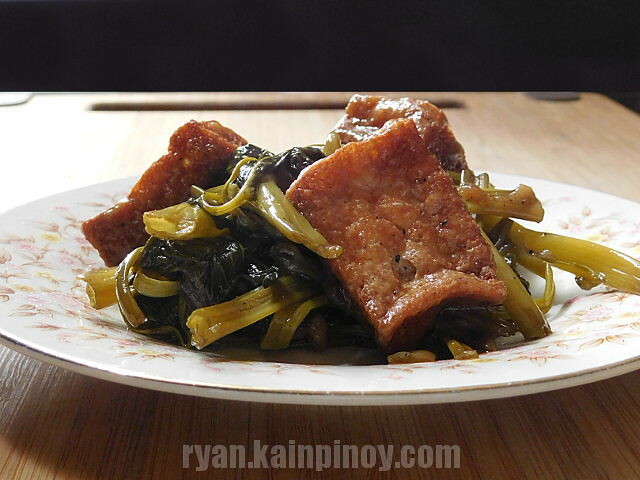 It’s a pretty dish easy to prepare and quite inexpensive too. It’s great as a side dish to fried fish, but also perfect on it’s own. I usually just eat it as is with some hot steamed rice. 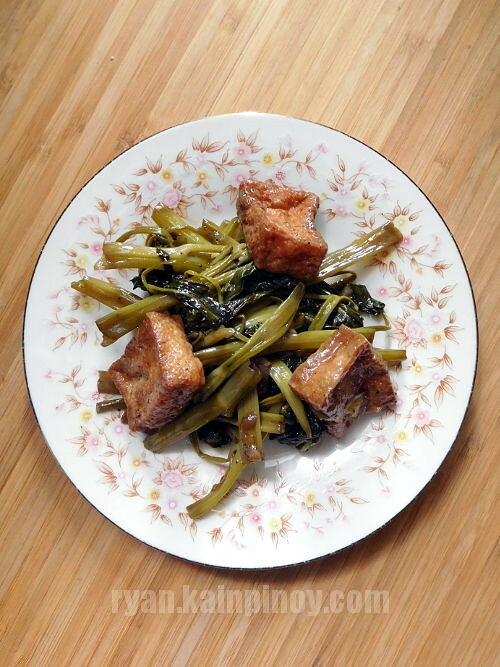 The sweet and salty taste from the oyster sauce gives the perfect flavor to this dish. Drain the tofu and pat dry with paper towels. Cut each block into 8. In a deep pan, heat some oil and fry the tofu until golden brown. drain on paper towels and set aside. Pick the kangkong leaves off the stems. Cut the stalks into 3-inch pieces, taking only the tender parts ( usually about the upper half of the stalk). Wash thoroughly under running water and drain. In a wok or shallow pan, heat some oil medium heat and saute the chopped onion. Once the onions become translucent, add in the garlic. Saute just until it starts to get fragrant and then add in the fried tofu, oyster sauce, and soy sauce. Mix slightly before add in the kangkong leaves and stems. Toss and cover the pan with a lid until the kankong has wilted. Season with black pepper and mix well. The dish is ready when the stems are already tender to the bite. Serve warm. Makes 3-4 servings.